This afternoon we were having quiet time like we always do after church and a snack. Mickey was going to be gone all day at a meeting in Indy so I really needed some rest to get through the rest of the day. When the hour was up the kids got out of their rooms and decided to watch a show/movie. This is totally allowed. I could hear what they were up to while I laid in bed reading. I could hear them getting into the refrigerator and using the microwave. No worries. Then it happens. I hear Kade yelling like he's scared. Meg starts yelling at Kade. Then they're screaming for me. I put my book down and get out of bed. By this time I hear the popping. It's not like popcorn, it's more powerful. I'm running down the stairs telling them to stop the microwave. Meg finally does but she's still yelling at Kade. Kade is crying, almost hysterically. I tell Kade it's alright but he's still crying. I try to calm Meg. She's still worked up but I finally get her to stop yelling. The event really freaked her out. I explain to her that Kade is only 6 and doesn't know any better. I also remind her that I'm the mom and she doesn't need to be yelling at Kade. I'll handle it. I turn back to Kade. It takes a few minutes to calm him down. He was pretty shaken too. (By this point I'm surprised at how calm I've remained through the ordeal. Good for me.) After he calmed down we had a little talk about not putting metal in the microwave. 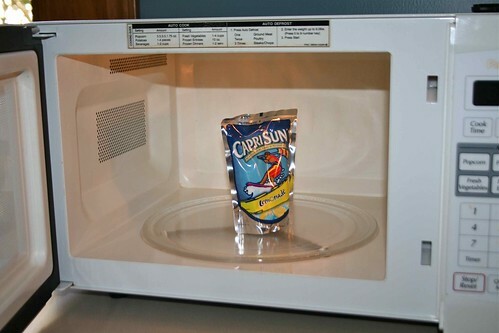 He told me he didn't put metal in the microwave it was a CapriSun. He was trying to thaw a frozen one to get it out of the pouch to put in a bowl so he could chop it up and eat it. I pointed out to him that the pouch was shiny like foil, both have some metal in them. I also told him a better way to thaw a CapriSun using a bowl of hot water. The photo is a reenactment. I was not with it enough to take a picture. I was thinking of only getting Kade calmed down. I'm thinking he'll never put anything shiny in the microwave again. Lesson learned, the hard way. Poor kid may never even touch a CapriSun again. Ah yes. I remember one of my boys yelling, "It's flaming! It's flaming!" when I was trying to take a nap. Foil burger wrapper in the microwave. Thanks for the memory.